When he is ordained a Missionary Oblate priest in about two years, Bro. Eugene Mwape Mule, O.M.I. will already have the missionary part of his job description well established. In his journey to the priesthood, Bro. Eugene has so far been a missionary in his native Zambia, Cameroon, the United States and now Canada. Treating people like humans first has been part of Bro. Eugene’s Oblate journey from the very beginning. He grew up in the copper mining region of Zambia in a family of miners. As a teenager he began to sense a religious calling but it wasn’t very strong at first. 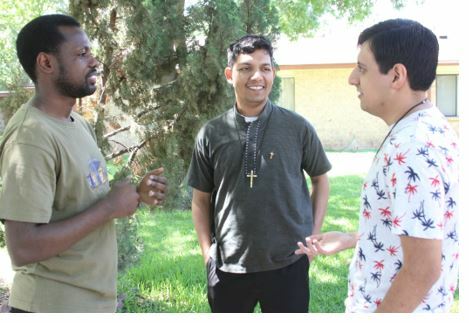 He attended a program for potential vocations with a group of friends who had a stronger pull to religious life. Ironically, Bro. Eugene is the only one from the group who is still pursuing the priesthood. Brother Eugene said he was attracted to the Oblates because of their willingness to minister to people most in need. This was particularly true when Bro. Eugene was a pre-novice working at Our Lady’s Hospice, a place where the Oblates and other religious congregations care for the dying who have no other place to go. After his philosophy studies as a pre-novice, Bro. Eugene’s Oblate journey took him around the world. He spent two years studying theology in Cameroon where he also became fluent in French. 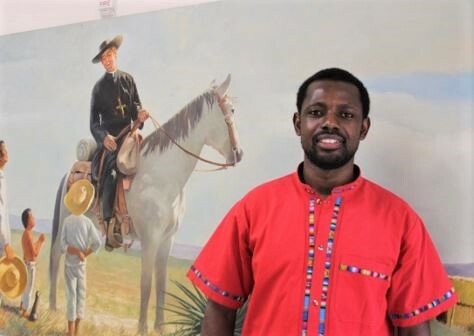 He spent a year at the Oblate Novitiate in Godfrey, Illinois and three years as a student at Oblate School of Theology in San Antonio, Texas. Currently, Bro. Eugene is spending a year of pastoral work about as far away from Zambia as possible, with the native people of Canada. He is ministering at Sacred Heart Church of the First Peoples in Edmonton. Sacred Heart is the official parish for the Catholic First Nations People in Edmonton and the surrounding area. It is a unique community where members use symbols, music and rituals which are part of native culture.